Three things you can do in December to influence the fate of hundreds of thousands of acres of Oregon forests. The fate of hundreds of thousands of acres of Oregon forests could change in the next sixty days, with decision points coming on the Elliot State Forest, a timber-backed lawsuit affecting the Tillamook and Clatsop state forests, and new stream rules for private lands in Western Oregon. Here are three ways you can get involved and make sure Oregon’s forests and rivers are protected for people, fish, wildlife, and local recreation economies. 1. Rally for the Elliot, December 13, Salem. The 83,000-acre Elliott State Forest holds some of Oregon’s last remaining coastal old-growth forest and is a stronghold for wild coho salmon as well as habitat for elk, black bear, and deer. But the state put the Elliott up for sale earlier this year. On December 13, Governor Kate Brown, Treasurer Ted Wheeler, and Secretary of State Jeanne Atkins will decide whether or not to accept a bid to purchase and log the forest. Attend a rally in Keizer on December 13 to show your support for rejecting the bid and keeping the Elliott in public hands. 2.Speak Up for Oregon Salmon Streams, December 15, Portland. After eight years of deliberations and extensive scientific study, the state is proposing expanded restrictions on logging near 2,500 miles of streams on private forest land in Western Oregon. Proposed forested buffers are a modest, but inadequate step to protect streams from warming. We would still be the least protective state for streams on the West Coast. Come reclaim Oregon’s environmental leadership and support stronger rules for fish, clean water, and wildlife. Join us at the Ecotrust building on December 15 for this important hearing. RSVP here. 3. Tell Oregon County Leaders to Opt Out of Forest Lawsuit. 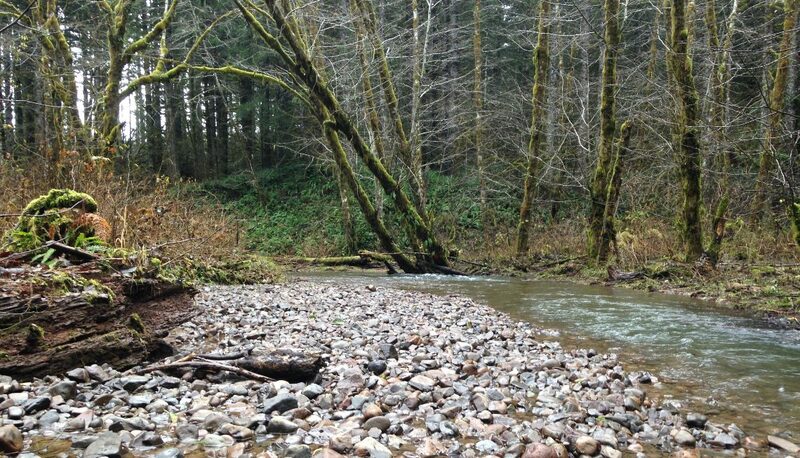 A timber-industry backed lawsuit is challenging the state’s right to manage the Tillamook and Clatsop state forests for multiple benefits – clean water, fish, wildlife, and recreation, as well as significant timber harvest. The $1.4 billion suit against the state is being spearheaded by Linn County and timber interests with mills around the Tillamook and Clatsop. It could lead to accelerated clearcutting on the forests to cover the suit’s damages. Because it’s a class action lawsuit, all Western Oregon counties, school districts and other government bodies that derive some timber revenue from the forests are automatically parties to the suit. Unless they proactively opt out, in the next two months. Tell county commissioners that our forests are too important to sacrifice to short-sighted logging interests. Urge your county’s forest representative to opt-out.